With immediately striking frame designs, exposed aluminum accents and modern Charcoal Gray finishes, the love seat, lounge chair, coffee table and end table in this complete patio set take a fresh approach to wicker style. 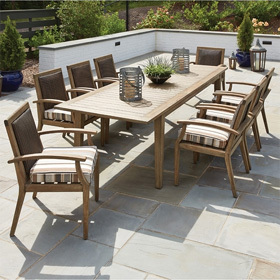 The seating and tables feature manufactured wicker construction that puts functionality first, offering exceptional all-season performance for the contemporary outdoor space. Plus, the love seat and lounge chair frames are generously sized, supplying deep seated comfort with its hidden reticulated foam (quick drying) cushion. Love Seat 64"W x 28"D x 29"H 60 lbs. Lounge Chair 39"W x 28"D x 29"H 35 lbs. Coffee Table 48"W x 24"D x 16"H 50 lbs. End Table 18"SQ. x 22"H 23 lbs.